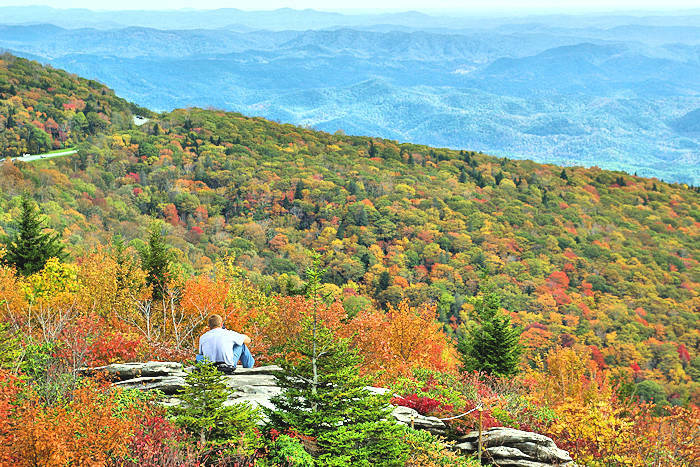 Fall is a very busy time for a variety of street festivals, events, art tours and more in Asheville and our mountain small towns. Most are free to enjoy! The autumn foliage color show adds to the excitement. See our Fall Foliage Forecast for a week-by-week color report. For events throughout the year, see our list of seasonal calendars. See our special list of top events, festivals and things to do during Labor Day Weekend in Asheville and the surrounding towns and mountains. Enjoy lots of rides, exhibits, animals, food and much more. Fun for all ages! We especially love the impressive exhibits in various buildings. See the many competitions from quilting, photography, extreme garden vegetables, flowers, crafts and more. Watch craftspeople at work. There's no place like the Beech Mountain's Land of Oz. Stroll along the yellow brick road, experience a recreation of Dorothy's journey from her home in Kansas and meet many of the characters so central to "The Wizard of Oz." The event sells out fast! Repeats every week until Sat Oct 26 2019. Watch horse competitions with the best riders in the country at the impressive Tryon International Equestrian Center with an exciting atmosphere featuring entertainment, food, kids' fun and Venetian carousel rides. Activities start at 5 PM. Arena action 7 PM. Free admission. Led by birding experts, events at Chimney Rock Park includes bird walks, workshops ranging from bird photography to hummingbirds, hawk watches and family nature walks. A quirky festival that celebrates the legendary Sasquatch, held in downtown Marion 36 miles east of Asheville. In addition to Bigfoot-themed items and local crafts, talk with sighters from across the country with evidence that it exists. Calling contest too! Free live music concert, as well as a wide variety of food and drink vendors. Lexington Avenue in Asheville. 5-9 PM. This free festival features traditional music, dancing and heritage craft demonstrations. A highlight is the World Gee Haw Whimmy Diddle Competition on Saturday. Experience the best of Latin American on Main Street in downtown Hendersonville. Journey through more than 20 countries with their people, music, art, food and culture. Free admission. 12-6 PM. This longtime favorite weekend at Nantahala Outdoor Center main campus near Bryson City features free attractions, live music and entertainment - along with great end-of-season deals. At this festival, hosted by the Holy Trinity Greek Orthodox Church of Asheville, you can sample some of the traditional foods and pastries (such as lamb shank, pastichio, spanakopita, gyro, souvlaki and baklava), watch traditional dancing and enjoy the authentic Greek music. Experience a country fair with plenty of local Cherokee traditions, including Indian games, food, competitions, music and dance. Meet the locals and discover more about their culture. Big parade on opening day. Repeats every week every Saturday 3 times. A festive day with picnics, sundresses, elegant hats, tailgating and the sights & sounds of thoroughbreds thundering past in Tryon, at the longest running steeplechase in North Carolina. The National Steeplechase Association sanctions four of the races. Sample beers from 45 breweries at The Salvage Station near downtown Asheville, while listening to a bluegrass-infused live band. Buy food from local vendors. This 21 and older event is held 1-6 PM. $45/person. Buy tickets in advance, starting Aug 15. Main Street in Waynesville transforms into an arts & crafts marketplace, one of the finest juried art shows in NC. Also enjoy live mountain music, clogging, entertainment and food. Browse many downtown galleries. Free. 10 AM-5 PM. This horticultural extravaganza features a juried display of bonsai by clubs from across the southeast, a renowned bonsai marketplace, workshops, free demonstrations and a popular Ikebana exhibit. Downtown Bryson City welcomes vendors to display and demonstrate all types of fly fishing equipment - rods, fly tying, apparel and accessories, kayaks and more. 9 AM-5 PM. Just a few blocks away is the Delayed Harvest stocked section of the Tuckasegee River. Celebrate fall beauty in the mountains with three blocks of festivities along Main Street in Marion, including 140 arts and crafts, food vendors, live entertainment, children’s activities, a 5K walk/run, quilt show, and so much more. Free admission. 9:30 AM-6 PM. Come enjoy lots of delicious Jewish foods in downtown Asheville, have your name written in Hebrew, learn about Jewish holidays and the Torah, and join in singing and dancing. Meet 200 craftspeople that come together in downtown Asheville with their fine handcrafted items, while local musicians play live on the arena stage and craft educators share their knowledge. Admission. Celebrate the coming of the snow season with woolly worm races, live entertainment and lots of food and craft vendors in downtown Banner Elk during peak fall color. Highly popular! 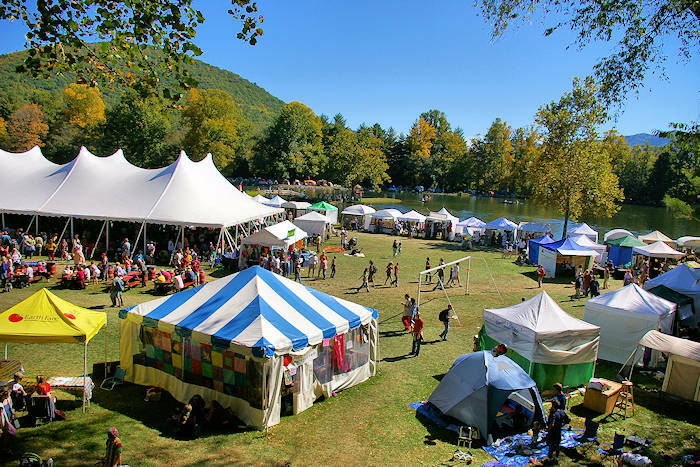 Two long-running festivals celebrate mountain craft, music and dance: the Heritage Festival and the Bascom Lamar Lunsford Music Festival. Both held downtown, adjoining Mars Hill University. Free. 10 AM-4 PM. Small fee for indoor evening concert. Experience the traditional fall activities that were an important part of rural life in the Great Smoky Mountains, including hearth cooking, apple butter and apple cider making, blacksmithing, lye soap making, food preservation, broom making and quilting. This free festival in downtown Asheville is a celebration of African-Caribbean culture with music, craft market, food vendors, dance performances and competitions, a special area with activities for kids and much more!